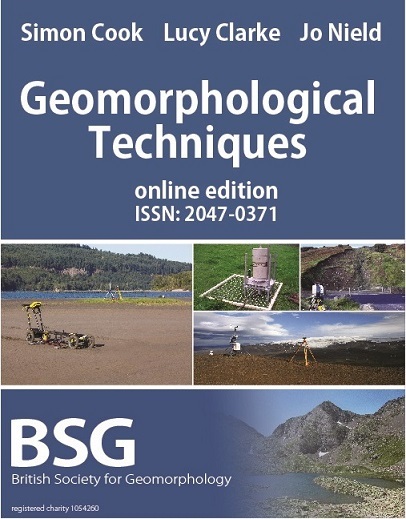 Geomorphological Techniques is a free online resource, outlining the current methods utilised in the particular specialist area of interest. The aim is to provide an up-to-date, evolving resource for geomorphologists to use and contribute towards. All articles are peer reviewed. Geomorphological Techniques chapters are published under a Creative Commons license - please see here for details. Are you an expert on a particular geomorphological technique? Have you just written a methods chapter for your PhD and would like to share it with the world? Would you like to help others to avoid the pitfalls you have uncovered, or get a head start at applying a method to further geomorphic research? The BSG are looking for authors to volunteer articles to contribute to an updated, online version of Geomorphological Techniques. Each article should be approximately 2000 – 3000 words in length, outlining the current methods utilised in your specialist area and will be peer reviewed by at least 2 specialists in the field. Honoraria of £200 are available for BSG members that author articles. Please contact the Publications Sub-Committee Secretary (Dr Tom Holt) if you are interested in contributing. The current table of contents is listed below, articles are allocated on a first come basis. Chapters with blue-coloured links are completed sections, which are now downloadable; article with greyed-out links are yet to be written. We also welcome new ideas for chapter themes. So for example, for Section 2.1.3 would be: Young, E.J. 2012. Section 2.1.3: dGPS. In: Cook, S.J., Clarke, L.E. & Nield, J.M. (Eds.) Geomorphological Techniques (Online Edition). British Society for Geomorphology; London, UK. ISSN: 2047-0371. For a flipbook version click here. Note that due to a technical issue, we are currently displaying all menus expanded below (work in progress).